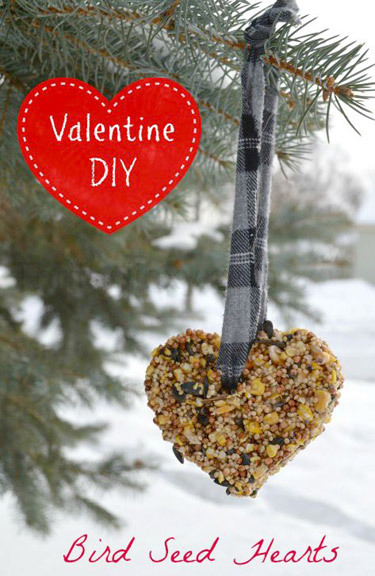 These Valentine Bird Feeder Hearts are an easy DIY way to share the holiday with your feathered friends! Line a cookie sheet with parchment paper, lay out your cookie cutters on the paper and cut your straws into thirds. Measure 1c of birdseed into a mixing bowl and set aside. Boil 1/3 cup water in the microwave using a microwave safe measuring cup or bowl. Immediately remove the water from the microwave once it begins to boil and stir in 1 pkg of knox unflavored gelatin until it’s completely dissolved. Then, pour the water mixture into the birdseed and stir until combined. Using a spoon, fill the cookie cutters with the birdseed mixture. You will want to pack it down so it’s nice and dense. Then, stick the straw pieces into the birdseed cakes wherever you would like to create a hole for hanging. It’s VERY important to do this step while the birdseed hearts are still wet. Once all your hearts are filled and the straws are in leave everything to dry. This can take a few hours. Very carefully remove the straws and cookie cutters from the birdseed hearts. The cakes are fairly sturdy but will break with too much force. Cut some twine or ribbon to your desired length and use it to tie the bird seed hearts to a tree outside. Then, sit back and do a little bird watching.